I love working with patterns (I was an English major, not a math major) but there’s something extra special about designing a quilt yourself. Barn Door is my original design but I know it is the result of inspiration from a variety of sources. I spend a lot of my stay-at-home-mom-free-but-not-really-free time online looking at quilts. I’m a really obsessive focused person so quilting is much more than a hobby for me. I have a hard time not cringing when people refer to it that way actually. So when I have to step away from the sewing machine because I have something important to do (like eat) my natural inclination is to stay quilt-focused by reading books and magazines about quilting and more often than not, reading quilting blogs. I am constantly inspired by the quilts I see you all making. I know that this design springs out of the many, many quilt images that are constantly floating around inside my head. But I did have a few more specific inspirations at the time that I made this sketch. 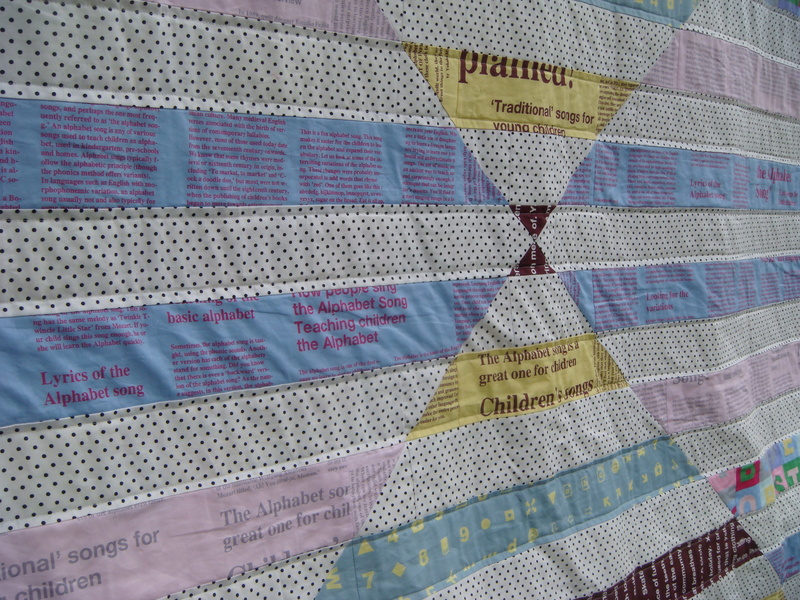 My primary inspiration was this quilt by Meg Callahan. (I know. Genius.) My fabric and color palette inspiration was master of low volume Red Pepper Quilts, whose blog brought this fabric line to my attention. The inclusion of dots instead of solid white is definitely inspired by Sarah Fielke, whose declaration “I don’t use solids” in the forward to her book Quilting From Little Things really got me thinking. I originally intended to piece the strips by joining the fabrics with 45 degree angle seams, like when you’re making binding. This would have given the whole quilt a smoother appearance (fewer seams). 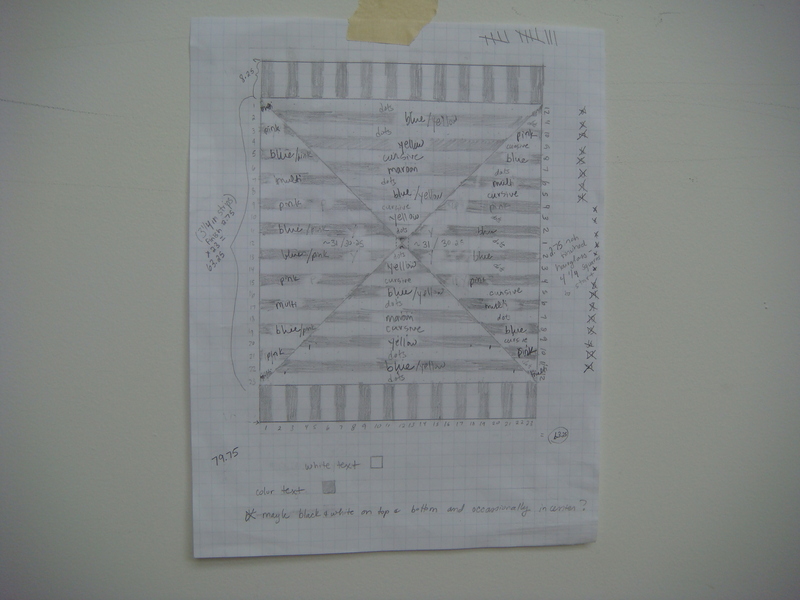 But when I got started I realized that the math involved would be way beyond me, at least if I ever had any hope of sharing this pattern with anyone else. So instead I opted for half square triangles and a lone hourglass unit at the center. For the back I knew I wanted to use up some of the leftovers. Of course then I got a little carried away playing with letters. As usual I did straight line quilting because I like the fabric and piecing to be the primary focus. And also free motion quilting scares me. I would definitely consider sharing this pattern with you guys if there is interest. Maybe a 2014 quilt-a-long? Linking up for Blogger’s Quilt Festival! I can’t wait to see what everyone else is sharing. Also linking up for: Fabric Tuesday, Needle and Thread Thursday, Thursday Threads, and Finish it up Friday. 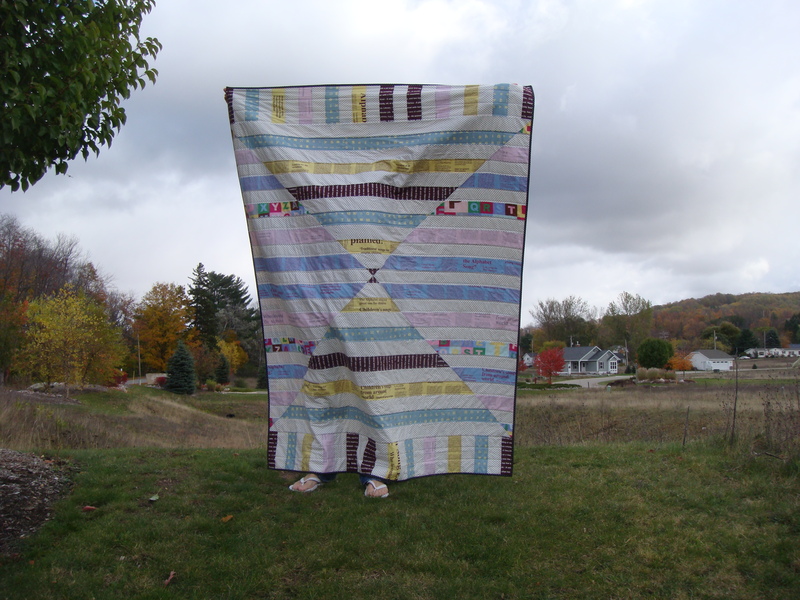 This entry was posted in Uncategorized and tagged Barn Door Quilt, Blogger's Quilt Festival, Finished Quilts. Bookmark the permalink. Gasp!!! Holy amazing quilt batman. I think my favorite part is the teeny tiny hourglass in the very middle. I would join in on a 2014 QAL, no question. 🙂 Very good work, Sarah. That is a very cool quilt, Sarah! I love how you used the text prints. The backing slays me. 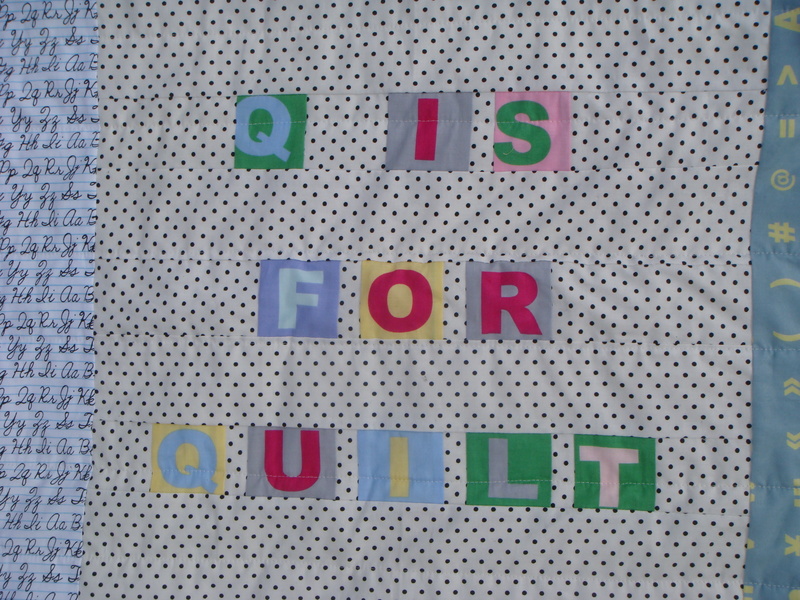 Q is for quilt indeed! Designing is so addictive. I had colored pencils and graph paper out today. Do you ever feel as an English major that quilting is the only arena in life where you’re willing to tolerate math willingly? I do! I bet if you do a quilt along in the spring, you’ll have a blast seeing all the different color combos that participants come up with. 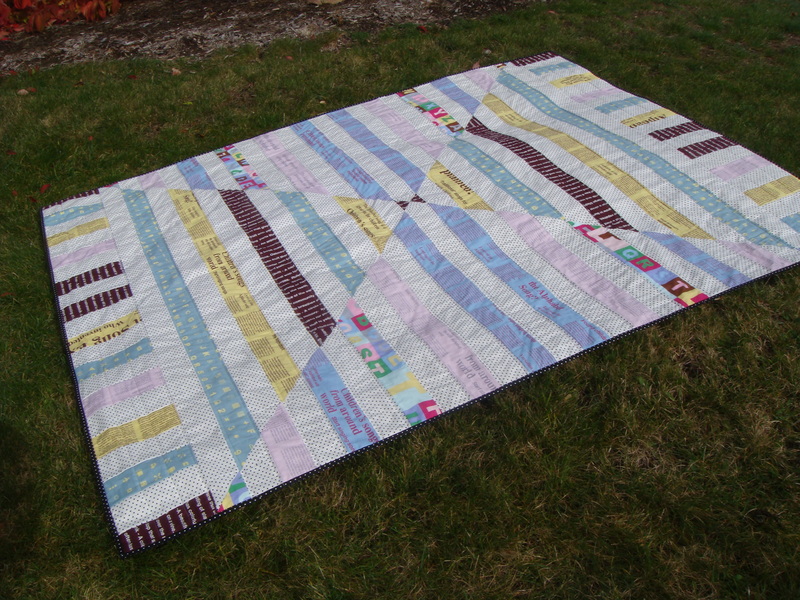 I like how the alternating light stripes give the quilt a somewhat fractured look. And, the word play on the back. Too.much.fun! That’s fantastic! I like all the choices you made with the design and fabrics. And I love the alphabet theme on the back too. 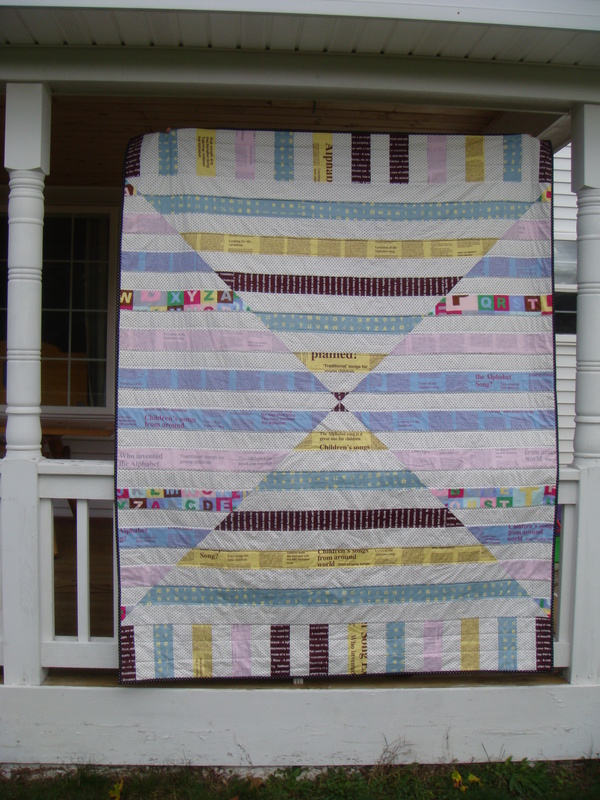 Great post Sarah ……loving this quilt and loving how you brought all your ideas together. The backing is fabulous too!!! Love the idea of a QAL. Genius! I love the low volume. 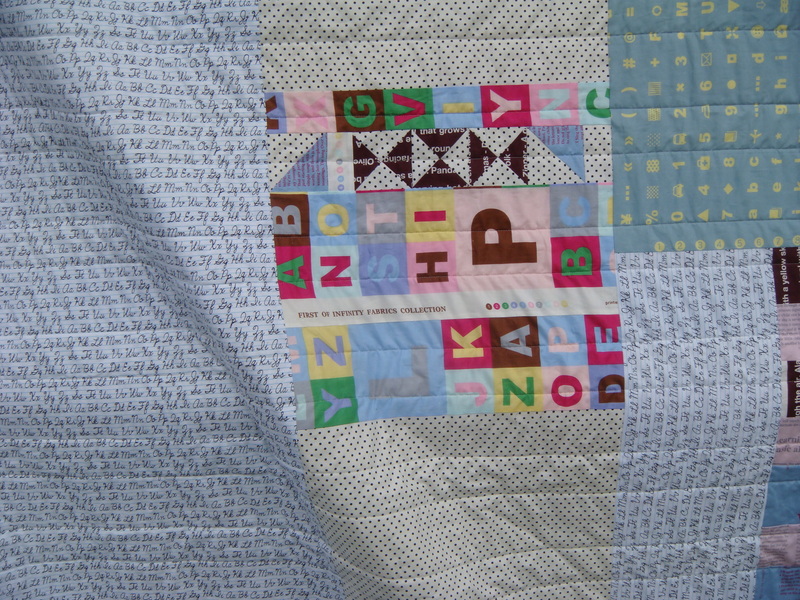 The letters are just what this quilt needed. Fun backs are a must. I think you should definitely do up a pattern – how amazing would it be to see other people inspired to make a quilt with your design? I’m not sure about a QAL – I’ve never done one, nor feel the need to do one, but lots of other people do. Such a great quilt!! I love that dot fabric!!! I would definitely make this quilt 🙂 it is fantastic. Gorgeous quilt. I hope you are getting to keep it. Great job. You shouldn’t be afraid of free motion. It is really fun and addictive. A little hard on the shoulders, but nothing a BIG glass of an adult beverage can’t conquer. English majors RULE! I could get on board with a QAL!! This is just fantastic! And i absolutely love the Q is for Quilt on the back! Great job, Sarah! Smart idea to use HST where the lines intersect. When I first looked at the back I thought you had pieced all the letters too! I was like… woa, you really went to town spending time on that! But I do think what you did with the letter fabric is really cool, especially that bit where you inserted some hourglass blocks. I love the design, Sarah! Great job. I love text fabric, so I don’t think you went overboard at all. It just creates a great extra layer of interest. I think a pattern is a great idea, a quilt-a-long even better. If you decide to do it, you can count me in! Congrats on a successful design! Your use of line is great! This turned out fantastic! Way to design your first quilt! So great! I would love to do a QAL! Sorry to drop the sentence but my dang phone isn’t cooperating. I hate tiny buttons! Anywho, I was trying to say that you may not be a math major, but I think the way you put it together is brilliant. I love designing, too! As many cool patterns as I’ve bought, there is a thrill in watching your own idea take shape and come to life that can’t be matched. Kudos! Bravisima! ummmm…. this is fabulous!!!!!!!!!! I don’t even know what else to write (and as a fellow english major, that doesn’t happen often:)). Totally on board for a QAL!!! Oh please share. What a neat idea! This is amazing!!! You did a wonderful job. Love the use of your text print. This is so fanciful! and great to see your process! hello Sarah thanks for your lovely comment. This is beautiful, what a great idea, love the polka sashing. 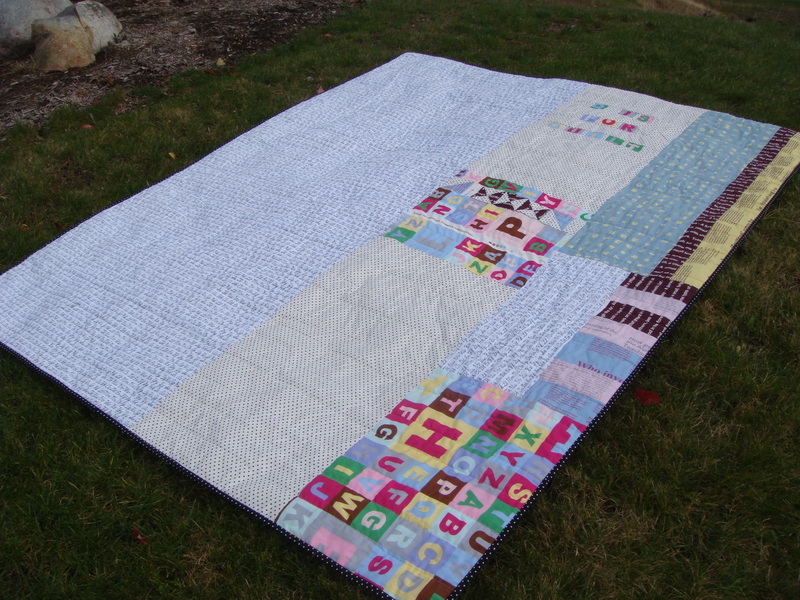 Love the “Q is for quilt”…clever! Super fabulous! Excellent use of First of Infinity. This is a really cool pattern! I love the way the lighter and darker prints contrast and create movement and depth. Beautiful, the back it really fun with the letters. I love how to colors really have a calm feeling in your quilt. Pingback: Barn Door Quilt a Long Mini | What the Bobbin?